A slight departure from the usual here, for folk who mainly use the Halogen for frying food, here is a unit combining the advantages of Halogen cooking speed and technology and its remarkable use of very little oil, only 5% of the usual amount you would use ! Other than using the wire rack to raise the food nearer the heat source in the cookers lid, there is no temperature control, only a timer. So you use the wire rack for low or high position and set the timer. For most foods this isn’t a problem, maybe for more delicate recipes requiring a low heat, it may limit the usefulness of the unit, but for things like fish fingers, chicken pieces, chips and other chipped veg, the Halo fryer gave a good account of itself, producing very edible, low fat food reasonably quickly. The bowl design with its removable paddle gives you a very versatile unit for cooking. It does chips perfectly, fish is light perfectly tender. Chicken , whether coated in breadcrumb or not is very tasty and not dripping in the cooking oil. You can prepare with ease Chicken Korma, sausages, or sausage casserole, chops , spring rolls, samosas and burgers. All with the minimum oil, which really improves the end result. Cooking using virgin olive oil is very economical and good for you. Use the paddle for stirring with casseroles and remove it for best results with chips and heavier or chunky food. What did the Halo Fryer Customers think…? Comments from customers feedback were very favourable, some thought the paddle was a poor idea but all thought the machine well made and produced first class results. When used without the paddle, my own efforts with oven chips and white fish turned out well, it takes a tiny effort to turn the chips at intervals, but well worth the effort, I’ve never had better results in a conventional oven, no burnt bits and no inedible raw spud in the middle. It is certainly a lot easier to turn the chips in the Halo fryer than it is under the conventional grille. Comparing to the similar Tefal Actifry, one customer noted that it is a little more bulky, on the worktop but made with good design and materials, the paddle is poorly designed but as I found out, it does work very well without it. He also said it took 30 minutes to cook chips properly, which is the time it recommends in the manual ! I found that jacket potatoes are really nice in the Halo, although taking 50 minutes ( compared to a microwave 8 minutes ) but does cook the skins super crispy and totally hands off. For anyone who places healthy cooking high on their list of priorities, this device deserves consideration. I am a vegetarian and use a lot of the meat substitute products such as the veggie sausages and burgers, these cooked very well in the fryer, better than grilling or normal frying, found Quorn cooked cooked better than I have ever tried, I’m not that keen on the Quorn fillets but this cooked it in a way that made it fall apart, lovely. 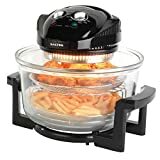 i have had the halo fryer for a while now think its great but cannot find any recepies for it can anyone tell me if you just use it like a normal halagen cooker and can you use tin foil in it ? They are definitely better, longer life halogen lamps than were the originals many years ago, but yes, occasionally they will fail. A lot depends on your handling of the oven and even the handling in the factory and delivery vehicles before you even purchased it! Yes with patience, commonsense and if you can purchase the right spares. If you are good with electrics, its not too difficult.